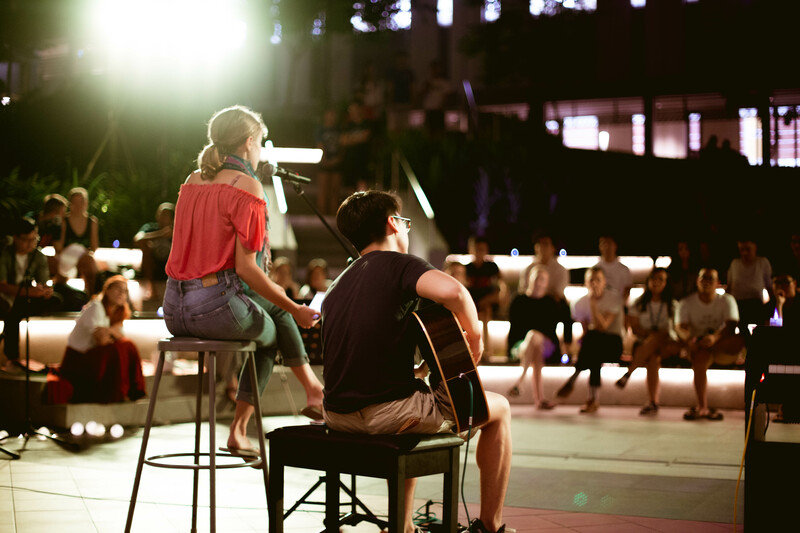 Yale-NUS College celebrated Peace Day for the first time on Sept. 20 with a series of talks, workshops and an open mic. Organized by the Elm College Office, Peace Day was held in conjunction with Peace One Day, a day of global ceasefire and nonviolence celebrated annually on Sept. 21. Assistant Professor of Social Sciences (Anthropology) Neena Mahadev gave the keynote speech, covering the Sri Lankan Civil War as well as environmental conflicts in the United States, such as the Flint water crisis and the controversy over the Dakota Access Pipeline at Standing Rock Reservation. The celebrations also featured a workshop on mediating interpersonal conflicts by Andrew McGeehan, Senior Manager of Residential Life, two documentary screenings: “Co-exist” and “First Light”, and various talks with topics ranging from indigenous rights to the role of mathematics in resolving conflict. Students performing at the Moonlight Session open mic. Residential College Advisor Evan Ma ’18, who was involved in organizing the event, said that Peace Day provided a great opportunity to raise awareness about conversations on peace. “In Singapore, [as] peace is usually quite institutionalized, you don’t really see violence. But violence happens in many different forms all the time. I thought this would be a great opportunity for people to start talking about important dimensions of peace, rather than just in the form of military violence,” Ma added. The Dean’s Fellows (DFs) of Elm College, Detmer Kremer, Julmar Carcedo and Rachel Tan, were inspired by the Peace Day events in their respective United World Colleges to organise Peace Day for Yale-NUS. “At Yale-NUS, it’s the first time we did this event. We didn’t know how many students would be interested in [it] or what they would be interested in, so we really opened it up to a variety of different topics,” said Ms. Tan. 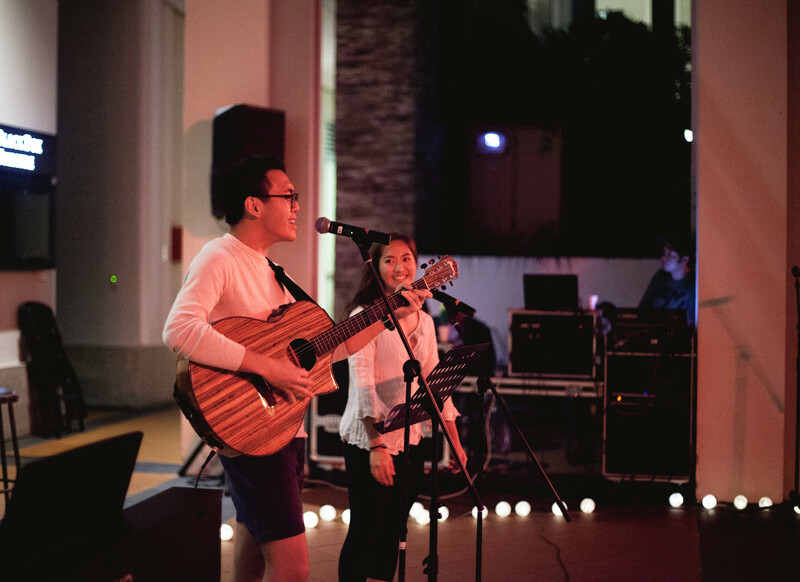 Darren Lee ’20 and Chan Kah Mun ’20 perform during the moonlight session open mic. Yale-NUS students gave presentations in two conference panels on various topics relating to the theme of peace. “We noticed that there was a trend that student panelists were interested in presenting work on indigenous rights and immigrant refugee conflicts and rights,” Ms. Tan said. She added that placing the student presenters in themed panels not only allowed students to deeply engage with one another’s experiences, but also contrasted different ways of working towards peaceful and sustainable living for marginalized communities throughout the world. Vasudha Kataruka ’19, who presented on the health experiences of Bangladeshi migrant workers in Singapore, said she was heartened by how Peace Day provided a platform for students to share their work with fellow students. “We should do more of these things, because a lot of us want to go out to become academics [or] be in positions of public speaking. It’s a good platform to make mistakes and learn,” Kataruka said. The celebrations also featured a Peace Day T-shirt painting session led by Rachel Johanna Lim ’18 and Kit Ling ’20, in addition to Moonlight sessions where students performed and expressed their individual conceptions of peace.